Cumbernauld Colts hit Vale of Leithen for six as they bounced back from their disappointing defeat to Edusport Academy. 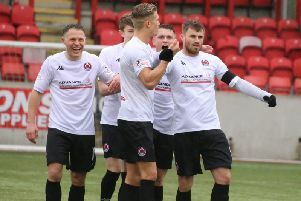 As the match began it took both sides time to settle into the game and it was the visitors who took a shock lead as Sam George scored an own goal. The ball was delivered into the box from a corner and the keeper got down low but, with the palm of his hand, slapped the ball in the wrong direction and into the net. Colts weren’t behind for long. Five minutes later wing-back Liam McCrory levelled the score with a header at the back post. And the hosts took the lead shortly afterwards through Craig Holmes. Vale weren’t without their chances though. George again looked less than convincing as he dropped the ball in the six-yard box with the visiting striker just too slow to react, not getting a clean enough contact on the rebound to hit the target. Colts extended their league through Sean Brown. As the ball was crossed into the box and both he and the defender failed to control but on the half-turn he hit the loose ball early and caught the keeper off guard. On the brink of half-time Stephen Kerr made it 4-1 with a left-footed strike which found the top left hand corner after squeezing through a collection of bodies in front of the keeper. With Colts well in front the second half was merely a formality. And if there was any doubt about where the three points were headed those doubts were erased when Brown got his second and Colts’ fifth goal of the day by slotting home from inside the box. With the result in the bag the pace of the game continued to drop and the game was played mainly in midfield with any chances coming the way of the home side. With around 10 minutes to go the final goal of the game came as Stephen O’Neill beat two defenders with great piece of skill and delivered the ball onto the head of Craig Murray whose header beat the keeper from six yards.